When fluid, gas or fluid with suspended solids flows at the optimal pressure or higher in the pre-determined acceptable direction, it pushes the plug away from the seat. This creates a gap through which the process stream may flow. When this forward flowing pressure drops and downstream pressure reaches the valve, the disc, cone or ball is quickly pressed back into place. A tight seal is created that prevents backwash. Ball check valves serve this purpose in a variety of forms, including free floating or spring-loaded balls. 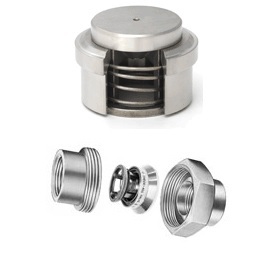 They are generally manufactured from simple, inexpensive metallic or plastic materials, although specialized ball check valves are also available. For example, ball check valves in high-pressure HPLC pumps used in analytical chemistry have a ball of synthetic ruby, a hard and chemically resistant substance. Ball check valves are used in spray devices, dispenser spigots, manual and other pumps and refillable dispensing syringes. Because they are durable, versatile, cheap and easy to use and repair, ball check valves are very common. They can be used as independent backflow preventatives or be part of a multi-plug product, like double check valve. Specialized plug systems, such as the pressure relief valve, may also include ball check valves. Even miniature check valves, which can be as small as a quarter of an inch, often use ball plugs. As with all valve genres, many industries utilize ball check valves, including water treatment, medical, food and chemical processing, petrochemical and agriculture. Although ball check valves are common, many considerations must still be kept in mind before purchase of it or any other type of check valve. Properly sized check valves are easily installed in pre-existing flow lines, using the dimensions of the pipe or tubing to determine the necessary size. But if the valve is too large or bulky, the pressure created by the process stream will not be able to open it, and an undersized apparatus will allow a continuous flow and never close. The materials of construction also impact the effectiveness of check valves. If incompatible materials are used, they will wear, erode or contaminate the process stream. However, with so many sizes and materials to choose from, proper research and preparation will guarantee a check valve that is appropriate. Ball Check Valves The basics of check valve installation, whose characteristics ball check valves share, involve a disc, ball or cone-like plug to rest on the seat or passageway in the cross section of the valve, blocking the flow of materials.